Is Grant Shapps being naughty on Wikipedia – or did a Lib Dem stitch him up? Grant Shapps: Was the Conservative Party chairman stitched up? The story of Grant Shapps and Wikipedia – which dominated news coverage of the General Election for a whole day last week – shows that new media can make a monkey out of respectable old media – even with a tale that falls far short of old media’s standards of proof. The purpose of what follows is not to defend Shapps, who is chairman of a well-funded national organisation - the Conservative Party - that can look after him. Nor is it to decide whether Shapps is guilty of the allegations or not because nobody today can say for sure. The point is that respected media organisations have become so in awe of Wikipedia that they’re prepared to flush age old journalistic principles – such as requiring two sources, or asking for hard evidence of an allegation – down the toilet. If enough people want to believe something is true, then a “Wiki-fact” will run and prosper, even if it’s based on the uncorroborated word of a single source. The tale starts in 2007, when Liberal Democrats were livid that then Shadow Housing Minister Grant Shapps was supposedly impersonating a Lib Dem activist. Shapps had blown his own cover on YouTube by posting comments while accidentally using the user name “GrantShapps”. Rumbled. Last week the Lib Dems got their revenge, with interest paid back. 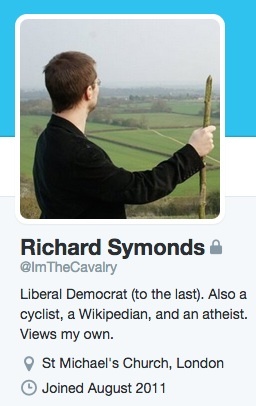 The Guardian ran a story based on evidence from a Liberal Democrat activist and paid employee of Wikimedia UK called Richard Symonds, who edits the online encyclopaedia under the handle of “Chase me ladies, I’m the Cavalry”. Symonds told the newspaper that he had suspicions that an account called “Contribsx”, associated with an account linked to Shapps in 2012, was violating Wikipedia editing policy. Curiously, the premise for the Guardian story – that the Contribsx account had been suspended – only took place about a quarter of an hour after the Guardian story was published. Nevertheless, the social media bush telegraph ensured the allegation spread rapidly, with the caveats removed, and it was picked up by the BBC. Channel 4 opened an inquiry. BBC presenters chortled away on Radio 4’s PM programme as they attempted to insert nonsensical and clearly absurd facts into a particular page on Wikipedia, and see if Wikipedia editors rejected them. Naturally they did, because the PM programme, with an audience of millions, had tipped them off as to exactly what would happen in advance – prompting Wikipedia to lock down that page, the programme's own Wikipedia page, thus making the exercise pointless. “It’s the wisdom of the crowd that gives you the best results in the long-term,” Rory Cellan-Jones told PM listeners. If the BBC had instead conducted an experiment to insert plausible-sounding errors by stealth, and see how many had been corrected in a year, or five years, then perhaps we could have judged whether that assertion was true. Indeed, the Washington Post, which is less smitten with Wikipedia than BBC News, reported on just such an experiment. In two months, only half the errors inserted had been corrected, leaving many others, some blindingly obvious, intact. More than 100,000 readers learned that "volcanic rock produced by the human body causes inflammation pain", for example. The record for the most durable hoax is almost ten years. The allegation against Shapps began to look suspect almost immediately. How did Symonds know Contribsx had been associated with the “Hackneymarsh” account when it hadn’t been active for five years and there was no record of the Hackneymarsh account's IP address ever having been checked in 2012? Wikipedia doesn’t retain IP addresses for more than three months. Symonds then changed his story. He said had more proof that Contribsx was Shapps or someone close to Shapps because of “behavioural” evidence. He wouldn’t say what this was. Trust me, I'm a Wikipedian. Channel 4 had described Symonds as an “independent administrator” conducting an investigation. Neither was true. Symonds admitted he had been “chastised” by “top officials”. The Wikipedia Arbitration Committee has started an official proceeding to investigate his conduct. The results will only be reported after the election, by which time probably nobody will be interested in them. Symond's statement changed from the assertion “the account is either run by Shapps/Hackneymarsh directly in violation or being run under his clear direction” to “I believe that the account is either run by Hackneymarsh directly in violation or being run under his clear direction”. Within a couple of days “Chase me ladies, I’m The Cavalry” was acknowledging that “it is impossible to know who was sitting behind the keyboard of Contribsx”. An Oxford academic with experience of editing Wikipedia pointed out the allegation was speculation, relying not on hard technical evidence but a much more ambiguous “behavioural” interpretation, which you can read here. The media circus moved on.